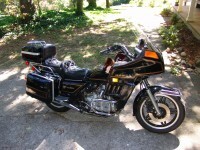 Motorcycle: 1985 GL1200A, 2006 Suzuki C50 Blvd. I'm wondered if you may know any sure way to route throttle cables correctly. I replaced mine and did not use a feed wire. Now I have sticking grip issues and I know it's the way I routed them. I had a look in both the service and parts manuals, and it's not shown in either. Someone will have to have a look at theirs and hopefully help out. Thanks any way. I think it's a hit and miss if you don't pay attention removing them. Thank you! 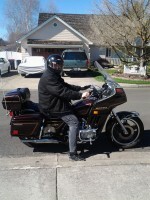 Been away from MCs too long when I had an opportunity to buy a 1983 Interstate, a bike from my youth. The bike and I are in about the same shape with everything falling off at the same time. 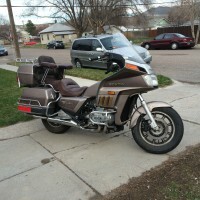 Without your series of articles my Goldwing would be sitting in the garage. Very well done. Thank you thank you thank you for all your DIY articles. 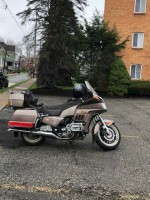 I bought a 81 GL1100 Standard that is similar to the 77 GL1000 I had in college - kitted out with vetter fairing and saddlebags. So far, I've pulled and rebuilt the Carbs (thanks to Raddak's kit), and while the carbs are off, doing the cables. And, surprise, the previous owner had been riding it without a push cable! The more I take apart, the more I find needs to be taken apart ::sigh:: Someday it will run again. At least the frame is solid with no rust.It has turned into a bit of a rebuild job, but at least it was running when I parked it 2 years ago after riding it home after purchasing it. 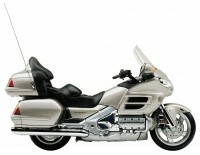 Now, I am finally getting around to making it safe to ride again, and your articles are invaluable. While digging into the carb issues on my ride I found the PO had kindly cut the push cable near the air filter! I was able to snake a new one in and with the slack obtained from loosening the pull cable finally get it in place. Maybe it's just my imagination but the bike seems to run smoother already! At least it makes ME feel better! Thanks, WingAdmin! Why does an airplane always start to run rough as soon as you fly over water??? That extra cable sure is comforting! As is normally the case, these how-to's are incredibly helpful, although each situation is unique. I did decide to leave the carbs in place which proved a little more challenging but a lot less work. I bought a 10mm open/box end wrench and had it bent at the open end which was pretty helpful in reaching the adjusting and lock nuts on the cables at the carbs, still thight, though. Another challenge that I had was feeding the old cables out through the bike. I think the fairing support has a tendancy to get in the way (as was the case I had when I removed the radiator on my last project). When pulling the cable through, the rubber sleeves and the adjusting nuts ons the pull cable along with the push cable would just not get through the opening they were routed through. After much head scratching and thinking about cutting the cables and routing the new ones differently, I worked out the issues of working space. The only other Issue I had was with the lock nut at the switch housing for the push cable. It bottomed out before tightening the curved cable housing sufficiently, so I had to devise some washers as spacers to make it work, but alas, the threads in the switch housing (plastic) did not hold out and were stripped. It's workable but I will have to replace it soon. Once again, very good info. I hope this helps. I'm just going by memory here, but starting at the grip the cables turn horizontally to the left and wrap around the front of the frame at the steering head. At this point, my cables turned toward the rear of the bike and were routed through a small triangular space (which was too narrow to pull both cables through at the same time) that was created by the main frame and the fairing frame (be careful not to run the cables around the wiring harness in that area - I ran one cable on the outside and one on the inside of the harness and it creates a pinch on the harness which could wear through the wiring - I still need to fix this!). From here they pass under the left side upper frame member which runs along the left side of the air filter housing. The cables run between this frame member and the air filter housing. As they pass the filter housing they pass over a short frame cross member that sits between the filter housing and the gas tank. At this point they turn down between this cross member and the tank toward the cable bracket on the back of the carb assembly. This is where the fun starts and I'll let the how-to article on throttle cable replacement take over. Thank you. I'm printing that up right now so I don't lose it! I appreciate you taking the time to explain it to me so I can get it done right. I should have the cables in this week (I hope!) so I can route them. Clean the tank, replace oil, antifreeze, etc and I can take her out for a test run I hope. Sure glad I found this site!! Yes, this is a great site! I learn quite a bit here. I was contemplating re-routing my cables outside of that small triangular area I mentioned because it was more a PITA getting them out than it was routing the new cables back through. Just take your time with things especially if you're not familiar with something. It'll come to ya! Re: How to replace your throttle cables/HELP !!!! 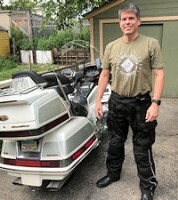 First of all let me tell you guys something,( thinking can get a man in lots of trouble) that being said I was thinking on replacing both of my throttle cable on my 1982 GL1100A, so I went looking for a "video", since I am a "normal" guy that,wait a minute, (not normal) if I was normal thinking guy I would not have started this project and went to a (professional), OK, I do better seeing things done than reading about them. Few question too all you brainy guys. I took the cables off because one was frayed and I am replacing the hand grips. So while I was doing this I changed the fuel filter and the hoses from the air filter housing to the 2 different places the hoses go with new ones. And I with help from a guy I know installed 2 sets of driving lights one under the fairing and the other on the engine guard that is on first of the engine. Anyway I got the new cable yesterday started putting this baby back together and realized that I had taken the signal housing apart to get the old cables out of them. What I did not remember was that I had to screw one to or both cables back into the signal housing to do it right. So I ask the false tank and the carb tubes do they all need to come out too get these cable done right or am I seeing thing in a way they don't need to be seen. I think one of the cable screw in and the other you screw the sleeve in. So theory is that one cable has to be screwed on with the signal housing part. So I I hope I am right at lease when the false tank is concern. Thanks get this done now I now know I don't have to do it next year. thanks ahead of time.!!!!!! Most importantly" IS THERE A VIDEO OUT HERE ON THE INTERNET THAT SHOW ME THESE THINGS" IF SO WHERE DO I FIND IT !!!! Hi I have a question I installed all my cables like you said but when I turn the throttle it won't return? Did I do something wrong? It will only go back if I push it back up now just a little back ground bike sat for 14 plus years in a garage so I pull carb clean them inside I didn't really take them apart just sprayed carb cleaner cause they were spotless inside but I do know for sure when I tried them without cables they closed on there own, please help this bike means the world to me it was past down to me from my grandfather who passed away, and I just wanna enjoy her!! Could be a number of things. You said the carbs opened and closed OK without the cables so they don't seem to be the problem. Were the carbs installed or not when you operated them? Maybe there's something that prevents smooth throttle movement when installed. The cables seem to be doing the push pull thing alright. 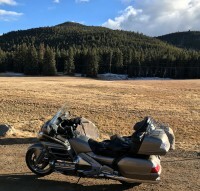 It sounds like there could be a kink or drag somewhere along the line, or maybe the throttle grip is binding on the bar, or the return spring on the carbs has just weakened over time. After about 12 hours today of putting the carbs on off on off so on I found there was build up behind some of the return springs so a lot of carb cleaner and pb blaster and working the throttle back and forth I found that if I removed the push cable the throttle snaps right back into place so I found once I got the push cable off which remind you were both brand new that when it was made they crimped it to tightly on the one end, so that cable is going back but right after that I got it running for the first time about 15 mins into it I had antifreeze pouring out the wheep hole on the water pump but only when I gave it throttle? Any ideas I order a new OEM Honda water pump already and gasket kit with the orings, is there anything I may have foregot to get? but with the throttle issue it was just a bunch of dirt&grime build up slowing the performance down to much to push throttle back. I never thought it would be so many issues just for being parked for so many years!! But she's worth every penny still doesn't skip a heartbeat! Well, it sounds like you got the throttle issue handled. As for the pump replacement, just follow the How-Tos on this site and you won't go wrong. Check for leaks elsewhere around the cooling system, flush properly and don't forget to use coolant compatible with aluminum engines, and ask questions! Thank you very much all your info is very helpful, and greatly appreciated! I know this is an old thread but the information here really helped me after rebuilding my carbs. Also for anyone else who may be doing this in the future if you loosen the intake runners on #1 and #3 cylinders and flip them upside down the bellcrank will be out past the fuel tank and much easier to deal with those stubborn lock nuts. Hey, your instructions were terrific. Yes, it's a tricky job getting wrenches onto the cable brackets on the carbs, but there was nothing wrong with how you laid out the job. Couldn't have done it without you. The string trick is a good one. Thanks brother. So, if you're twisting the intake runners on 1 and 3, you pull the carbs out to the left, is that correct? It seems like that would be the way to go. My pull cable just broke on my 85 LTD leaving it somewhat stranded. Does anyone know if there's any way to use the push cable work as the pill cable so I can get the bike home? That k you!